On the parent node, you must list all the child nodes that the parent replicates to. You can create a replication profile to be deployed to the child node. The replication profile enables the sharing of system settings between parent and child nodes. To create a replication profile, also referred to as an archive, see Managing Archives. 1. From the parent node, go to System > Central management > Child nodes. • Node name — Enter a unique name to identify the node. Node names may only consist of letters, numbers, spaces, underscores and full stops. Unicode is not supported. This parameter is mandatory. Note: If the name is the same as that of a child node already in the system, the existing child node is overwritten. • IP/hostname — Enter the IP address or hostname of the child node. This parameter is mandatory. • Comment — Optionally, enter a comment describing the child node. • Replication profile — If required, from the drop-down list, select the replication profile to be deployed on the child node, that was created in About Replication Profiles. • Central logging — Select to access logs and reports for this child node from the parent. Do not select this option if you want to access the child node’s logs on the child node itself. • Allow parent to monitor status — Select to be able to view node status from the parent. 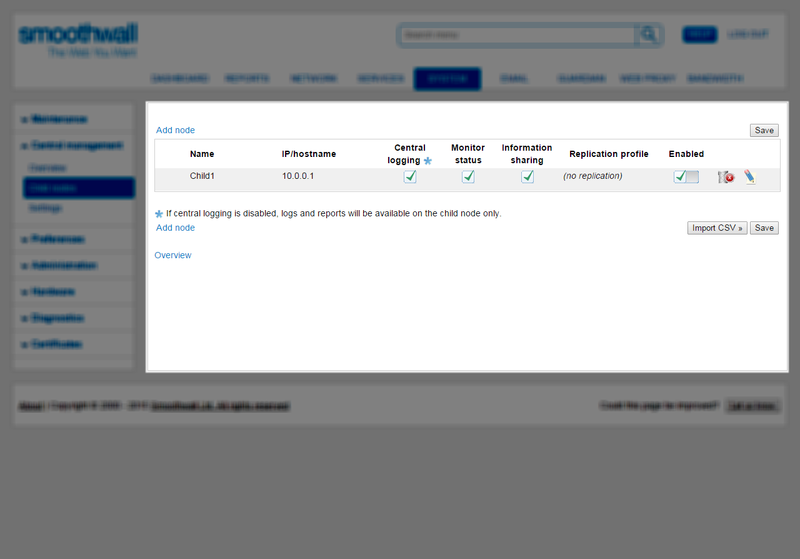 Status updates are available from the System > Central management > Overview page on the parent. 7. When prompted, review the node details and then click Save to add the node. 8. Go to System > Central management > Overview. The parent node lists the child nodes and displays their current status. For more information, see Working with Nodes. If child node information is available in a comma separated file (CSV), you can import it directly into the parent node. A unique name to identify the node. Node names may only consist of letters, numbers, spaces, underscores and full stops. Unicode is not supported. The IP address or hostname of the child node. This parameter is mandatory. Whether to access logs and reports for this child node from the parent. Note: Do not enable this option if you want to access the child node’s logs on the child node itself. Whether to be able to view node status from the parent. Whether the parent node manages the child node's resources, such as Guardian quotas which limit user access to web content. When enabled and quotas have been used in a web filtering policy, the parent ensures that users cannot bypass their allocated quota by using a different child node. The replication profile to be deployed on the child node, that was created in About Replication Profiles. This field is optional, and can be left blank. Determines if the node settings are enabled or disabled.  Enabled — Enter: yes, on, or 1.  Disabled — Enter: no, off, or 0. A comment. This field is optional. It may consist of letters, numbers, spaces, underscores and full stops. Unicode is not supported. 1. On the parent node, go to the System > Central management > Child nodes page. 2. Click Import CSV, go to the file and select it. Click Import to import the contents of the file. 3. The parent node displays the contents of the file and notifies you of any errors in the file. Note: Importing settings from a CSV file will overwrite existing nodes with the same name. 4. Click Confirm to import the information in the file. The parent node imports the node information and displays it. 1. Go to the System > Central management > Child nodes page, locate the node you want to edit and click Edit node. 2. Make the changes required, see Adding Child Nodes to the Parent Node for full information about the settings. 3. Click Confirm, review the changes and then click Save to save and implement the changes. 1. On the System > Central management > Child nodes page, locate the node you want to delete and click Delete node. When prompted, click Delete to confirm the deletion. 2. Repeat the step above for any other nodes you want to delete. You may need to disable a child node in a system, for example, in the case of hardware failure. You can do this by disabling the child node system-wide. 2. Locate the node you want to disable area, select Disable and click Save. 3. Repeat the steps above for any other nodes in the system that you want to disable system-wide.